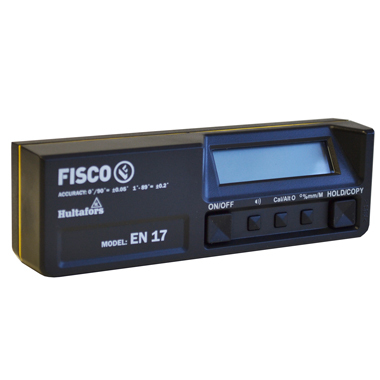 The EN17 digital inclinometer allows for the accurate measuring of angles and gradients in 0.1 increments, in either degrees (from 0°to 360°) or as a percentage. It's the ideal instrument to use for all those building projects that require some degree of levelling alignment. The inclinometer is highly accurate and simple to use. Overhead measuring and the measurement of sloping ceilings or similar, is made really easy with the unit's reverse reading capability. In addition, for the measurement of gradients in areas where the display cannot be easily read, there is a hold button which will maintain the measured value, allowing the display to be read away from the job. Audible alarm (beeps at 0° and 90°). Automatic switch off (after 6 minutes). Hold button to retain measured value. Easy change over of units displayed (° or %). Reversible reading for inverted measuring. 1x9V PP3 battery supplied (approx. 20hrs operation). User manual and guarantee certificate included.